What a cool day. At our very first, and hopefully far from last, book reading and signing for A Girl From the Hill today, I was again reminded how much I love my friends and family. Believe me, there is no feeling better than being surrounded by people who love and support you, and who truly enjoy watching and listening as you live a tiny piece of your dream. I started A Girl From the Hill nearly three years ago. My mother and I both put in a lot of work, me listening, writing, re-writing and thinking long and hard about some tough subjects; my mother telling me things to be shared publicly that haven’t even been shared with everyone in her family. Pain, suffering, loss. Things that change a person forever. She revisited these places with me, along with going back to lots of good places. We certainly had laughs going back to Marshall Street together. I had nightmares about today all week. One dream with 174 people packed into the tiny Davisville Free Library where I spoke. One with people yelling out questions which I couldn’t answer. Once with all of my family screaming at me. Boy am I uptight. The good news is that a beautiful little library opened its doors to me, my family and friends for an hour or so of reading, laughing and sharing. And Dahlia enjoyed it so much, more than I imagined. I felt such the pride watching her and listening to her, answering questions, laughing, feeling the adoration of the group and giving it right back. And even though I spent the day fretting and fussing and driving my poor sister Maree nuts, getting to the point where the poor woman couldn’t even watch the traffic for me as I backed out of my mother’s driveway, once I got settled in everything changed. In the moment, exactly where I was meant to be at exactly the right time. Satisfaction and contentment from bringing our work full circle. I don’t know how I’ll do at our next gig, with perhaps more strangers and less familiar faces. But today, my peeps gave me the strength, courage and determination to do this again. Me and the Crow are ready for it. 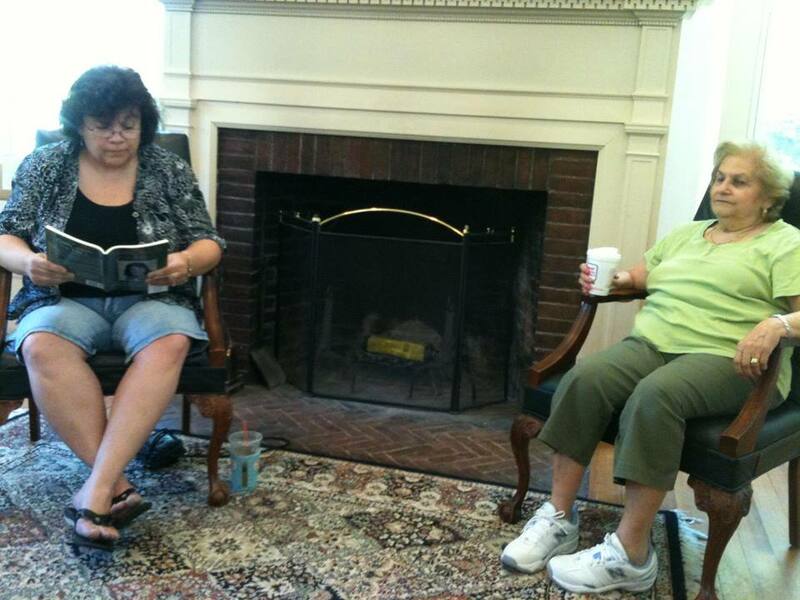 This entry was posted in Aging Parents, Books, Family, Joy and tagged A Girl From the Hill, Book Reading, book signing, Books, Dahlia, Davisville Free Library, Family, Girl From the Hill, Library, Marshall Street, Rhode Island Authors by pattytmitchell. Bookmark the permalink. I received my copies of the book earlier this week, but didn’t have time until last night to sit down and read! I couldn’t put it down. I was drawn into the stories and the family as if I was an observer right there on the wall. Wish I could have been there for your big day, but was definitely with you in spirit. A thought kept running through my head as I read a number of times in the book that you felt you weren’t always the best daughter, nicest person to your mom, or most understanding of her. What I took away from the book, after reading it and feeling all the love you have for her is this: You couldn’t shine forth all the love and devotion for her if you hadn’t experienced the time of feeling cut off from her, irritated by her, or even angry at her. In order to experience one thing we have to experience the whole. You wouldn’t have been able to tell the stories as you did (with all that love and appreciation) if you hadn’t seen the other side. That move on to say your mother couldn’t have been the wonderful, loving person she is if she hadn’t had the challenges she faced in her lifetime. Basically it all comes down to love and understanding that we experience the things in life we need to in order to be the people we are. Everyone needs love and craves it. You’ve given your mother a wonderful git by sharing her stories. I’m sure your daughter will do amazing things for you, but first she’ll have to disengage from you once in a while in order to appreciate all that you are! BIG HUGS!!!! Loved the book and can’t wait to share it with those tagged for gifts of it. Laura thank you – I love the way you can take a complex situation and get to the root – such a gift! I am so glad you enjoyed reading the book. Makes my heart swell (in a good way!) when I receive compliments from someone as talented as you are. Glad that you were there in spirit, as I needed all the confidence I could muster to start talking! You are so right- we cannot experience the true positive of appreciation until we go through the bumps. And that first hug I got yesterday after reading from my daughter made everything worth it- whether her father prodded her or not doesn’t change it!! So glad your reading went well. Sorry I’m too far away to attend.